An elegant cake for your celebration. 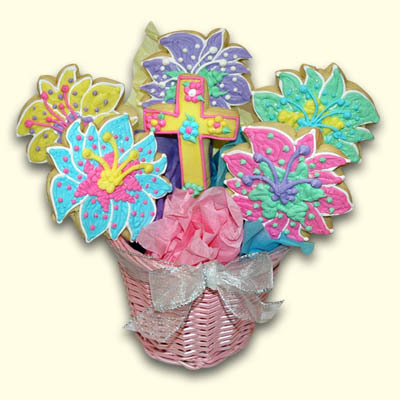 A delicious way to celebrate many occasions: christening, baptism, confirmation, and Easter Sunday. Select the cake, filling, buttercream, and colors. We will personalize with a name or message to match your event. This cake serves 25- 40 guests. Our artists can create a cross cookie to match your cake as a favor and personalize the cookie with initials or a name if desired. A beautiful gift for your guests and to commemorate a blessed event. Also available in a smaller size.